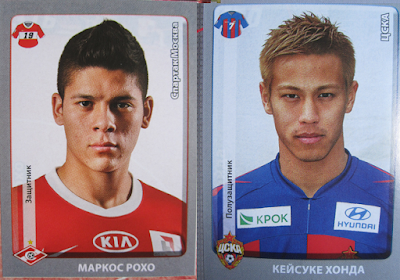 Panini released its first album of the Russian league in the season 2011/2012. In the years before, three albums were released by a Russian publisher (in 2000, 2008, and 2009). The album and stickers (including names of the players) are of course in Russian language and thus difficult to read for foreigners. Opening the album, there is the table of content on the left and the introduction with four stickers on the right: the league logo (two shining stickers), the ball of the competition and the sticker to celebrate the 50 years of Panini. The album continues with four pages with results and best moments of the previous season 2011. These pages include 24 stickers of actions and celebrations. The 16 teams included are showed in alphabetical order. For each team there are 25 stickers displayed over four pages. These stickers are the shining club logo, the team photo (two stickers), the star player in action, the home kit, and 20 players. There is space for six update stickers on the last page of each team, but an update set has never been released. Zenit Saint Petersburg won the title of the season 2011-12, confirming the success of the previous season. The teams from Moscow finished the season behind, in the following order: CSKA, Dynamo, Spartak, and Lokomotiv. The album ends with the calendar of the season and the format of the competition.This section include the last two shining stickers: the trophy of the competition. *The album includes space for update stickers (up to six stickers per team), but this has never been released.